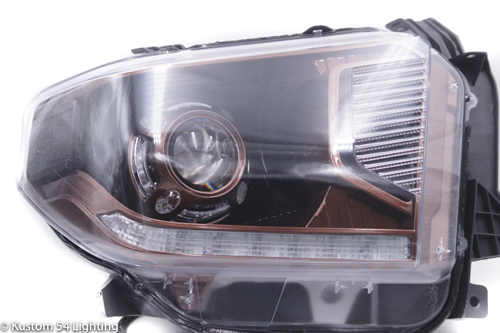 Welcome to our Q&A page, here you will find answers to most frequently asked questions regarding the drop down options on Custom headlight builds, if you are not finding the answers to your question below or feel we could add anything to this page that has not be explained please feel free to contact us. 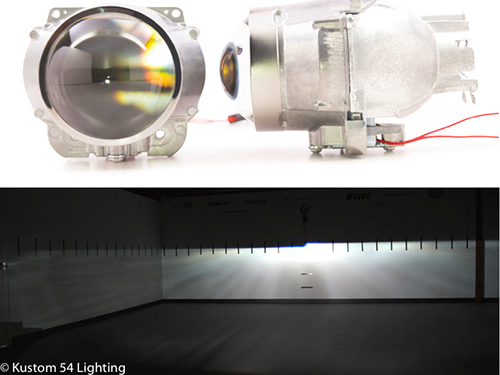 One of the most widely used projectors for retrofitting, The Morimoto H1 is a step above our K54L projector. 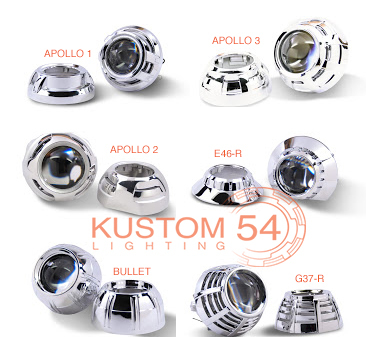 Perfect for anyone looking to put any high end cars lighting output to shame on the road. 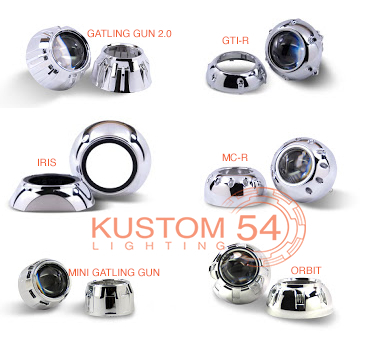 One of the most requested projector at Kustom 54 Lighting. 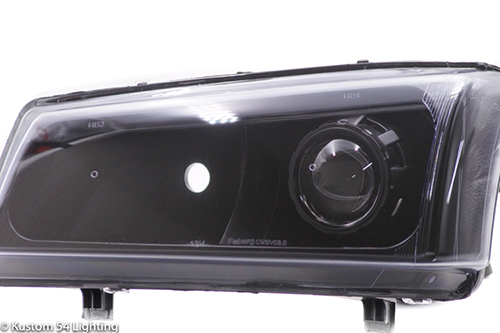 The D2S 4.0 impressive output and size allows us to fit it into virtually any headlight makes this projector without a question the best bang for your buck. 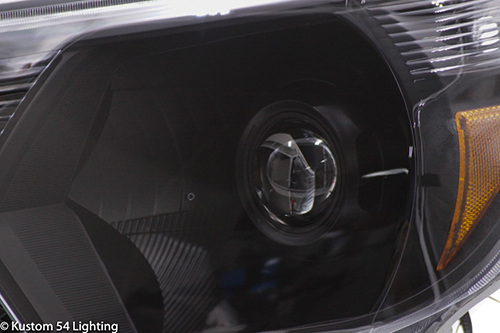 Main purpose of a shroud is to cover up the projector and provide an aesthetically pleasing look to your headlights. 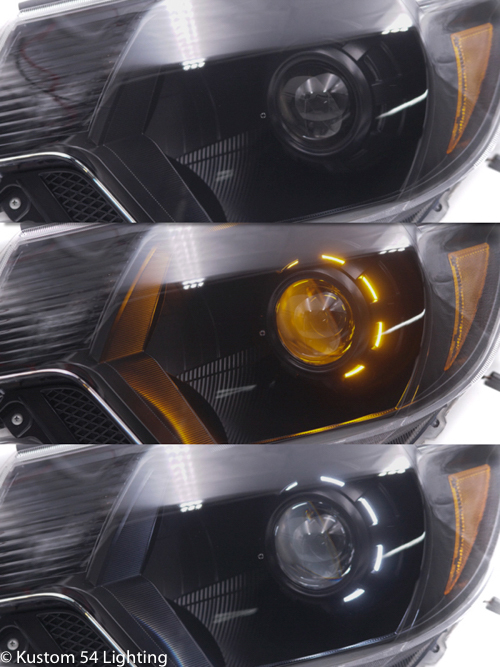 Shrouds vary in design allowing to achieve different looks for any one type of headlight. Please keep in mind that not all shrouds will fit into every housing, our website generally only lists shrouds that we know for a fact fit the headlights we build. However, If you want a different shroud that is not listed on our site please contact us and we will be happy to help you in tis selection. Our flat black option is Automotive NI SHINE black coat that is sprayed through an HPLV paint gun. "Front Shroud" refers to the way the halos are mounted and seen. 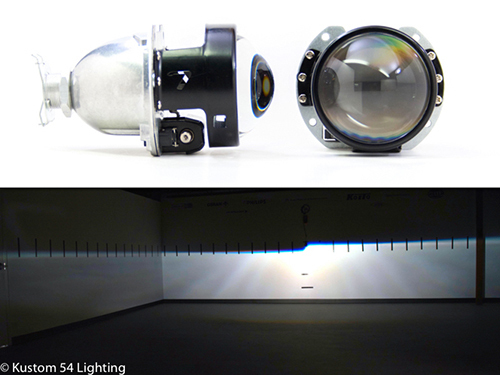 With this option it will be mounted in front of the projector shroud and be fully visible when they are ON or OFF. 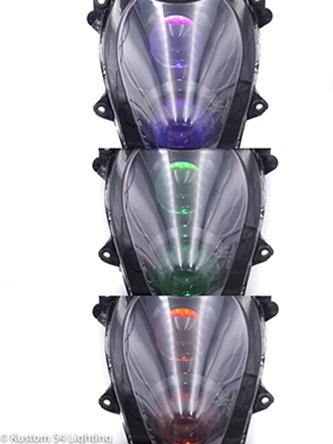 Please refer to pictures below to see this look. .
RGB Color Changing Halos are RED, Green, and Blue which allow for them to cover a huge spectrum of colors, with these halos you will not get a "Pure" white color. These halos come with a remote to turn the halos "ON" and "OFF" and to change the colors. You will receive all necessary wiring and drivers along with color changing remote and RF module. Be cautious of your state laws and use the color changing feature at your own discretion. 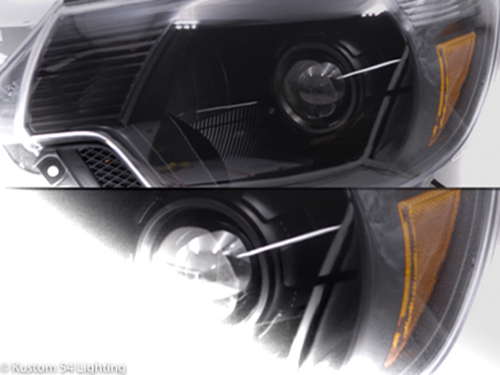 "Behind Shroud" mounting is referring to the way the halos are mounted and seen. 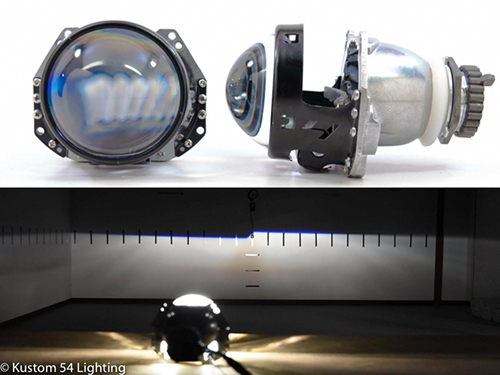 With this option they will be mounted behind the projector shroud and be fully visible only when they are ON. When the halos are OFF they will not be seen at all. This option is only possible on shrouds that have vents in them but not for full solid shrouds. Please Refer to pictures below for this look. 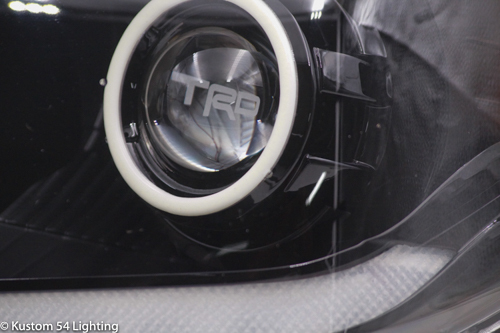 Switchback White/Amber halos are White main color halos that you can run on your vehicle as Day Time Running Lights and with our harness the process is almost plug in play. 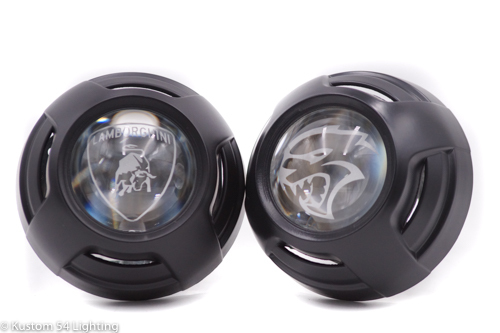 The halo is also amber which is a separate function you would need to hook up to your blinkers with our tap connectors. 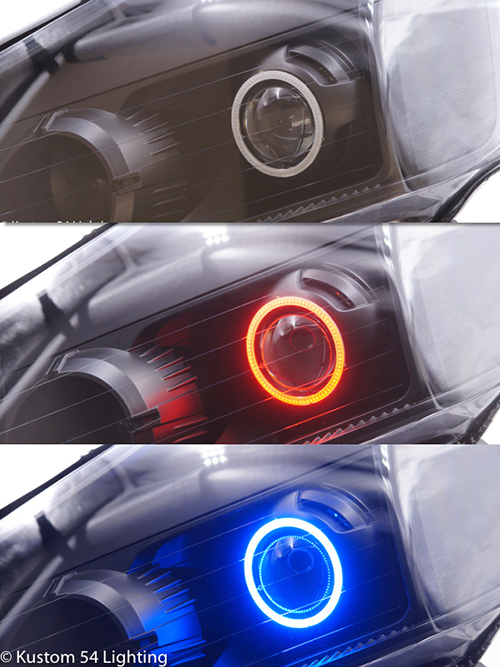 This feature will allow your halo to act as a turn signal then automatically turn back to white when not activated. We highly recommend having some vehicle electrical knowledge or professional installation. 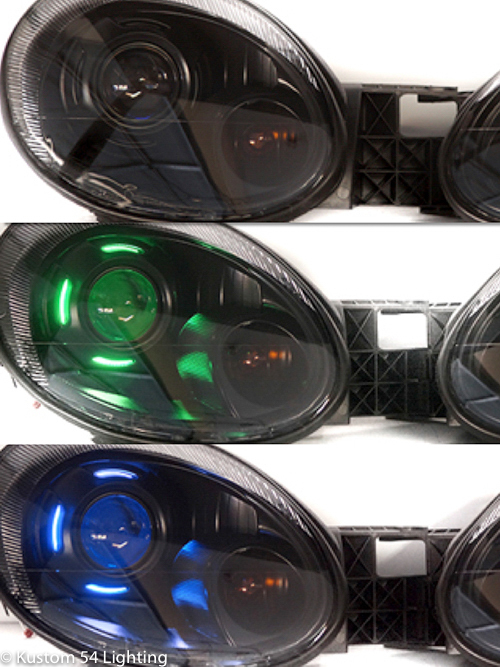 RGB Color Changing Halos are RED, Green, and Blue which means they cover a huge spectrum of colors but keep in mind with these halos you will not get a "Pure" white color. 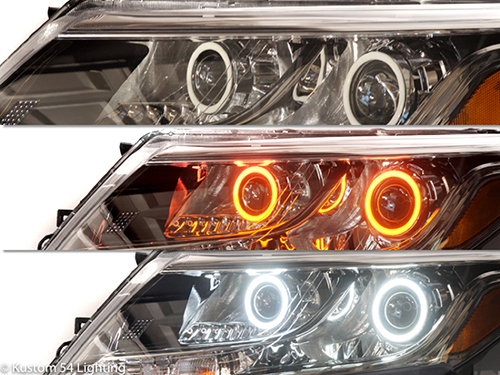 These halos come with a remote to turn the halos "ON" and "OFF" and to change the colors. You will receive all necessary wiring and drivers along with color changing remote and RF module. Be cautious of your state laws and use the color changing feature at your own discretion. 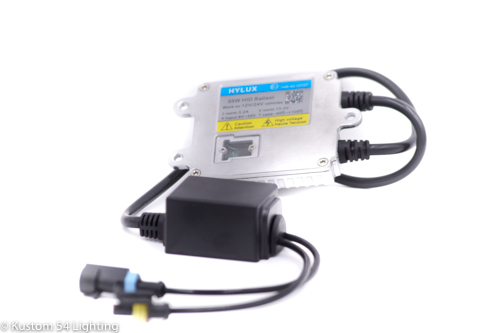 Hylux HID kit is a combination kit that which we put together using CN Brand lights bulbs paired with the Hylux Ballasts. The Hylux kit also comes with a harness for plug and play installation. These kits are backed by 3-year warranty and are outstanding alternative to the more expensive kits. 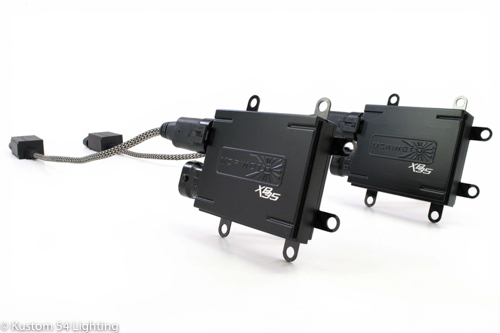 Morimoto HID kit is a full morimoto ballast/bulb/harness combo with outstanding quality and warranty replacement of 3 years just like our Hylux kits.